I know some of you are still melting in the heat, but over here in the San Francisco area, each day is looking more and more like fall! YAY! I’ve said it before on here but fall is one of my absolute favorite seasons when it comes to styling. I love how many accessories you can add to a look with hats & scarfs and don’t even get me started on the boot options. And layers… I love them. With the change of seasons comes switching your wardrobe over. I always keep some of my favorite sweaters and scarves from the previous year but I also always like to add a few basic fall/winter necessities to my wardrobe when it comes time. I’ve been browsing online and in some stores now that most of the fall attire is out and I’ve found some great deals on some perfect fall staple pieces. Pieces that will last you all season, can be styled multiple different ways and can be worn for many years to come. 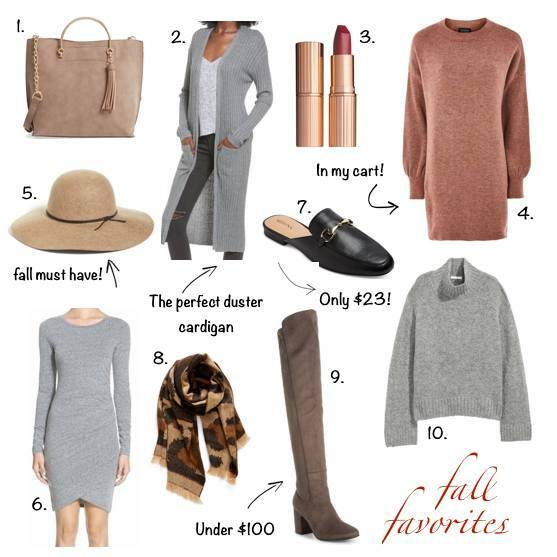 I’ve rounded up my favorite fall finds and explaining why I love them below! 1.) Metal Handle Faux Leather Satchel – I talked about this bag a little bit on my Instagram stories the other day (@ashdonielle) and I was so excited to see that you guys loved it as much as me! Comes in 3 colors, under $50 and can be worn as a cross body or carried on the forearm. I got the taupe color because it matches with everything! 2.) Rib Duster Cardigan – Talk about the perfect fall sweater! Comes in black & grey and is SO comfortable. I love the length and think it will be the perfect cardigan over a simple tee, denim and boots. (I got the size medium for a looser fit). 3.) Charlotte Tilbury Lipstick – We all know I love these lipsticks so there is no explaining needed there. Some of my favorite shade for fall include “Bond Girl” & “Red Carpet Red”. 4.) Topshop Sweater Dress – I’ve seen a lot of blogger gals wearing this adorable sweater dress with over the knee boots, so I had to have it! So comfortable and fits oversized. (I got a size 6 for reference). 5.) Floppy Hat – I’m a serious hat lover and this one was recently added to my collection for the season. Comes in three different colors and completes any fall look! 6.) Long Sleeve Dress – I have the tank top version of this dress in four different colors. It’s a STAPLE piece in my wardrobe, pregnant or not. It’s a comfy t-shirt material that has some ruching around the tummy, making it flattering on everyone! The long sleeve version came out for fall so of course I had to have it! Can’t wait to style it with a cute vest! (I got a size small for reference). 7.) Black Mule Slides – Ok, if you don’t get these for $23, you’re going to have major FOMO. Mules are SUPER in for the season right now and these look identical to a pair of designer Gucci mules. Such a steal! 8.) Leopard Scarf – The leopard trend is going no where, so do yourself a favor and grab this chunky scarf for your fall wardrobe. I love that it’s kind of a different take on the traditional leopard print you see every year. 9.) Over The Knee Boots – Everyone needs a good pair of over the knee boots for their closet this time of year. I recently just got this pair in charcoal (under $100 – size up a whole size) & this pair in black (under $40 – size up a 1/2 size). 10.) Turtleneck Sweater – Everyone needs that one amazing turtleneck sweater for fall; the one you find yourself wearing on repeat. That was me last year with this sweater. I wanted it in other colors, but it sold out so fast. This year they’ve brought back basically the exact same sweater (length is a little different) and you better believe I scooped up some more colors! Such a great sweater and the turtleneck part is warm and unique! Wishing you all some fun fall shopping and a great weekend!